Sometimes four ninja turtles just aren’t enough. 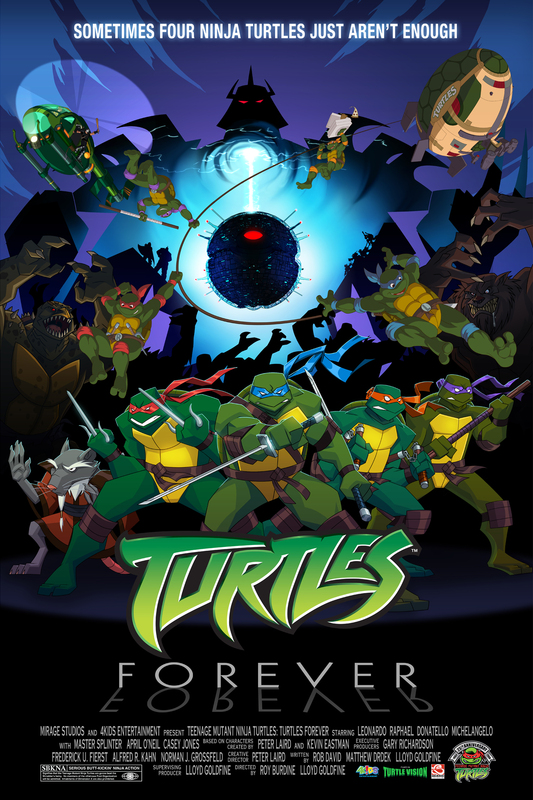 Turtles Forever is a 2009 made-for-DVD animated feature in celebration of the 25th anniversary of the Teenage Mutant Ninja Turtles franchise. This flick teams up almost every incarnation of the turtles — chiefly the campy characters from the Murakami-Wolf-Swenson 1987 animated series and the grim ‘n’ gritty cast of the 4Kids Entertainment 2003 animated series — in an adventure that spans multiple parallel universes. It also marks the finale to the 4Kids series. Conceived as one long story, but written and produced in three equal parts so that 4Kids would have options in how to broadcast it, the plot of Turtles Forever began in a hermetically sealed conference room in New York City. There, Lloyd Goldfine (TF‘s Writer, Director, Producer), Matt Drdek (Writer) and I (Rodeo Clown) banged Lloyd’s collection of trusty old Ninja Turtle action figures against our (numb)skulls for one hundred and thirty-seven hours until a story fell out of our brains. The movie hit TV first on The CW4Kids, followed by Nickelodeon and Nicktoons, before landing all ninja-like on DISC (released by Nickelodeon/Paramount Home Video). Newsarama.com named Turtles Forever one of the top ten direct-to-DVD animated movies of 2009! You can read my two parts here and here.